[147 Pages Report]The organic fertilizers market was valued at USD 6.30 billion in 2017 and is projected to grow at a CAGR of 12.08%. The base year considered for the study is 2016 and the forecast period considered is from 2017 to 2022. 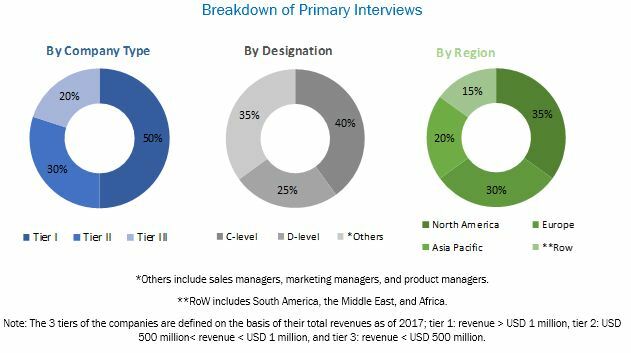 The basic objective of the report is to define, segment, and project the global market size on the basis of source, crop type, form, and region. The other objective of the report is to understand the structure of the market by identifying various segments. The report also helps in analyzing the opportunities in the market for stakeholders, providing a competitive landscape, and projecting the size of the market and its submarkets in terms of value. This research study included secondary sources (which included directories and databases)—such as Hoovers, Forbes, Bloomberg Businessweek, and Factiva—to identify and collect information useful for a technical, market-oriented, and commercial study of the market. The primary sources involved in the study include industry experts from the core and related industries as well as preferred suppliers, dealers, manufacturers, alliances, standards & certification organizations, and organizations related to all segments of this industry’s value chain. In-depth interviews were conducted with various primary respondents, such as key industry participants, subject matter experts, C-level executives of key companies, and industry consultants, to obtain and verify critical qualitative and quantitative information as well as to assess future prospects. The following figure depicts the market research methodology applied while drafting the report on the market. The key participants in the global market include organic fertilizers manufacturers and suppliers. The key players profiled in the report include Tata Chemicals Limited (India), The Scotts Miracle-Gro Company (US), Coromandel International Limited (India), National Fertilizers Limited (India), Krishak Bharati Cooperative Limited (India), Midwestern BioAg (US), Italpollina SpA (Italy), ILSA S.p.A (Italy), Perfect Blend, LLC (US), Sustane Natural Fertilizer, Inc. (US), BioStar Systems, LLC (US), AgroCare Canada, Inc. (Canada), and Nature Safe (US). With the given market data, MarketsandMarkets offers customizations according to the company’s specific requirements. 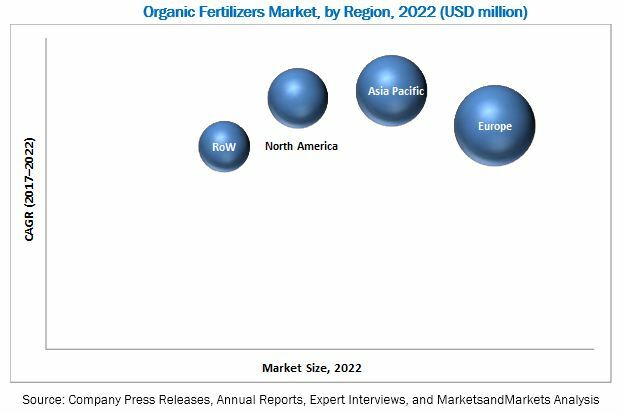 The organic fertilizers market is estimated to be valued at USD 6.30 billion in 2017 and is projected to reach USD 11.15 million by 2022, at a CAGR of 12.08% during the forecast period. The organic fertilizers are synthetically produced and are based on the byproducts of crude oil refining and certain other mined and naturally-occurring minerals. These fertilizers replenish the soil and have a positive impact on crop quality and quantity. However, the utilization of synthetic fertilizers poses a risk in terms of contamination through leaching to groundwater and surface water bodies as well as the transfer of synthetic residues to the food chain. This can adversely impact human and animal health. To ensure optimum nutrition, the soil is replenished with additional fertilizers, which provides it with nitrogen, phosphorous, and potassium among other necessary nutrients. Based on the source, the animal segment dominated the market, holding the largest share in terms of value in 2017. Animals, fish, and birds are utilized to produce organic fertilizers, including blood meal, bone meal, and manure that helps in the growth of crops. They contain primary growth nutrients, such as nitrogen, phosphorous, and potassium. According to The Agricultural Research Service (ARS), a research agency of the United States Department of Agriculture (USDA), in 2014, chicken manure increased the cotton yield by 12% over chemical fertilizers. Animal-based organic fertilizers are further segmented into manure, blood meal, bone meal, feather meal, fish meal, and other by-products. The blood meal segment dominated the market for animal-based organic fertilizers, with a share of nearly 32% in 2016. Blood meal is the powdered blood of animals, which contains 14% of nitrogen and micronutrients, such as zinc, copper, and boron. Based on the crop type, the market is segmented into cereals & grains, fruits & vegetables, oilseeds & pulses, and others. The cereals & grains segment accounted for the largest share of the global market in 2017. Cereals are one of the most important staple crops across the globe, and rice ranked first among cereal crops, in terms of the volume of production in 2014, according to the Food and Agricultural Organization. Organic fertilizers help cereal crops to absorb nutrients more efficiently. They are one of the critical components of nutrient management and are renewable and more cost-effective as compared to synthetic fertilizers. These fertilizers not only enhance plant growth and yield but also improve the health and fertility of the soil. They also help in improving crop immunity to diseases, thereby reducing expenses on crop protection chemicals. Based on the form, the market is segmented into dry and liquid. The dry segment accounted for the largest share of the global market in 2017. Dry organic fertilizers can consist of a single material such as rock phosphate, or it can be a blend of different ingredients. These fertilizers are cost-effective; however, they are required in large quantities as compared to the liquid form, as they are not completely absorbed by the crops. Almost all dry organic fertilizers provide an extensive range of nutrients; however, there are a few dry organic fertilizers with a balanced proportion of NPK and micronutrients. They are widely used among farmers as they do not require the use of advanced technology-based hardware. Asia Pacific is projected to witness the fastest growth in the market during the forecast period. In terms of value, the market is experiencing high growth around the globe, especially in the Asia Pacific region. Increase in per capita income leads to high demand for organic food, which also drives the market for organic fertilizers in this region. Along with this, advancements in communication technology have enabled people to become aware of the growth and wellness dynamics, which has boosted this market globally, especially in developing countries such as Brazil and India. The major crops produced in these countries include fruits & vegetables, cereals, and grains. The key countries that play an important role in agriculture include India, China, and Australia. Cotton, sugarcane, fruits & vegetables, and cereals are the leading agricultural commodities exported from these countries. One of the major restraining factors for the growth of this market is the increasing reliance on inorganic techniques of cultivation. With the growing food demand, farmers are increasingly relying on the application of synthetic fertilizers to optimize the productivity of the cultivated land. Of the various developing countries, China witnesses a higher use and simultaneous increase in the use of synthetic fertilizers, increasing from nearly 377 kilograms per hectare in 2002 to nearly 565 kilograms per hectare in 2014, which is higher than the global average. The key players such as Tata Chemicals Limited (India), The Scotts Miracle-Gro Company (US), Coromandel International Limited (India), National Fertilizers Limited (India), Krishak Bharati Cooperative Limited (India) are focusing on adopting growth strategies to expand in the global market. These companies have a strong presence in India and North America. In addition, these companies have manufacturing facilities across these regions, with a strong distribution network.